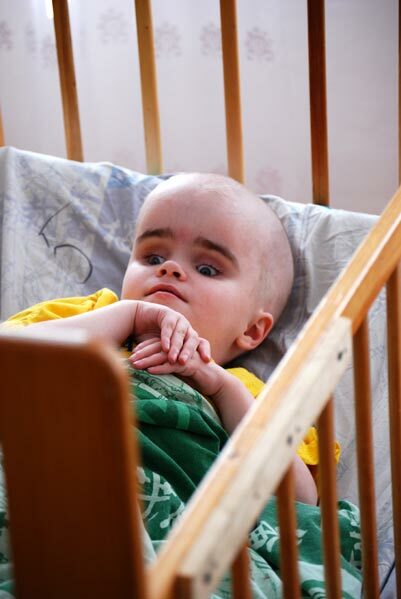 The Chernigov Child’s Home is located far off the beaten track in rural southeastern Ukraine. It is 52 km. (32 miles) as the crow flies east from Melitopol and 45 km. (27 miles) south of the district seat of Chernigov. To travel by car from Zaporizhzhia, the oblast (the region) capital requires some two-and-one-half hours. The last 10 km. (6 miles) to Kalinovka, after turning west off of P48 from Tokmak, follow a single-lane, gloriously potholed road. 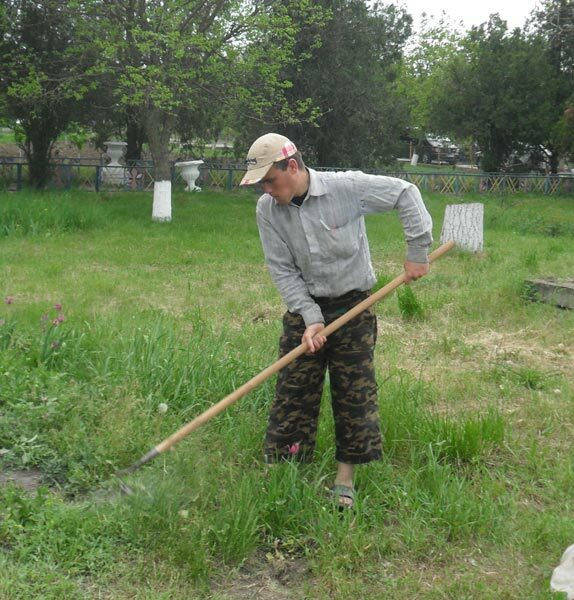 Just before reaching Kalinovka, perhaps without even noticing it, a visitor passes the cemetery where some 400 disabled children lie buried in shallow trench graves. Cell phone: +3 8 050 744 62 84. 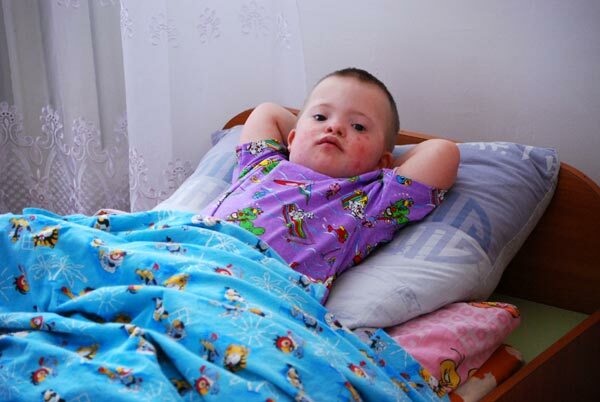 Since January 2017 Chernigov Child Home was transformed- some wards were moved to “Tavria (Kirovo) House for Disabled people” and to “Zaporozhye Orphanage for boys with mental disabilities”. 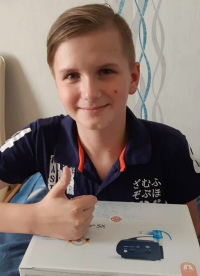 But seven of well-known children from Kalinovka: Artyom, Oleg, Maksim, Katya, Zhenya, Vera and Varya are now living in “Happy House – 1” in first foster family house. As they deserve more care and love – now they are living in better conditions, are happy with attention they are paid every minute. More about their life, needs and ways to help you can find in our project “Happy house – 1”. 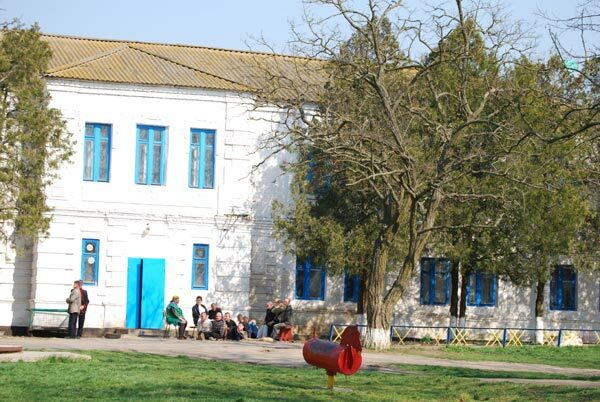 Chernigov Child Home changed the profile of institution – now its Chernigov neuropsychiatric care facility for adults (men), where wards over 18 live. In one of the classes our caregiver still works: together with wards they paint and draw, make their own wall newspaper, hand-made crafts. One of them is really fond of knitting, others try to learn according to their possibilities. All that caregiver does is important and valued for the wards, these are small steps to their socialization, to make their long days in asylum more bright and various. Through developing fine motor skills wards activate their mental skills, learn how to control their small movements and behavior in general; read together loudly and learn new words, make stories. We are able to keep this caregiver working only due to the constant financial support from our partner and sponsor from GB Vinca Petersen and her team. All your help is valued and appreciated! The Child’s Home is 150 km (93 miles) away from the region center. The orphanage is not financed adequately to buy fuel for children’s travels, therefore all the children have to spend their days within the orphanage 365 days a year. The Child’s Home in the village of Kalinovka has become the second orphanage I’ve visited for my hopefully long volunteer life. 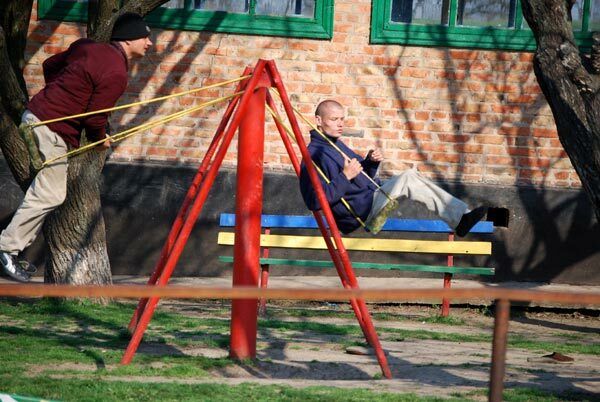 Oleg is a very easy child in that regard. If something interests him, he will spend hours on that activity. He won't even take a nap during nap time until he is finished playing, whether it is putting together a mosaic or winding up a musical toy. Whatever engages his attention that day is what he'll be focused on the entire day. 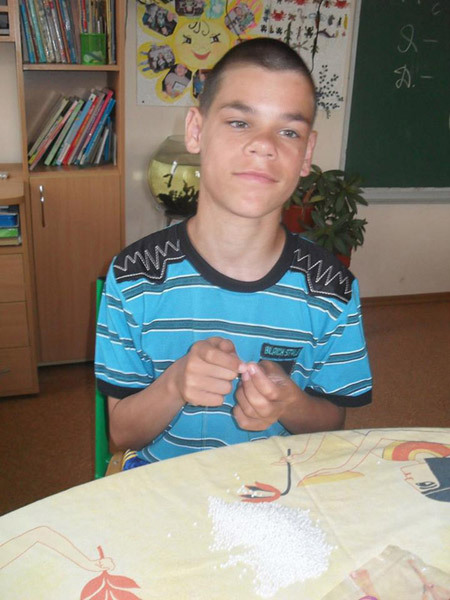 Recently, he started learning how to make seed bead crafts in the class with other boys. And even though he hasn't created any masterpieces himself thus far, nonetheless his perseverance and diligence guarantee his success in this difficult work. Oleg likes to take walks outside, and, if there are no outside toys, he enjoys playing with sticks and blades of grass. He likes to study the nature around him the way he likes best - touching everything and breathing in the scents of plants. And, last of all, Oleg likes being photographed. He prefers to be photographed in one position only, for some reason, but he tries to stand still and not to make faces for the photo, even if he was laughing and jumping about on the ground just before the photo was taken. 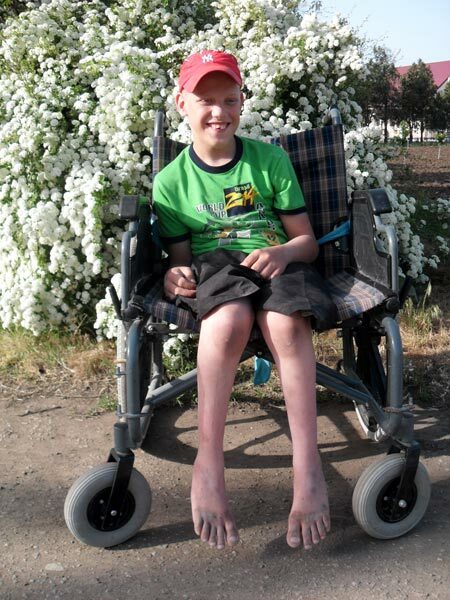 Here’s another orphan – Artyom who has the same problem with his legs. Nevertheless he is so charming with his sunny smile, and ability to support a conversation and his kind way of teasing everyone! Artyom often asks the same question “And do you love me”? What he really needs is a simple “yes, I do” instead of toy cars and candies. It seems that only a few out 120 dwellers of the Child’s Home are aware of what goes on around them in the world. Although it seemed like these little children with special needs were so far away from us and what went around them, we changed our opinion after accompanying some of them on an excursion to the sea. The following day after the trip little Yulia and Oleg came to us and gently stroked our hands. Truly speaking, when I visited Germany I myself had a very naive attitude towards such children with special needs. I could not really understand why there were so many of such children on the streets, parks, and merry-go-round. It seemed to me that these little and adult wheelchair users with their vacant looks did not realize what they were doing in this city and on this planet. 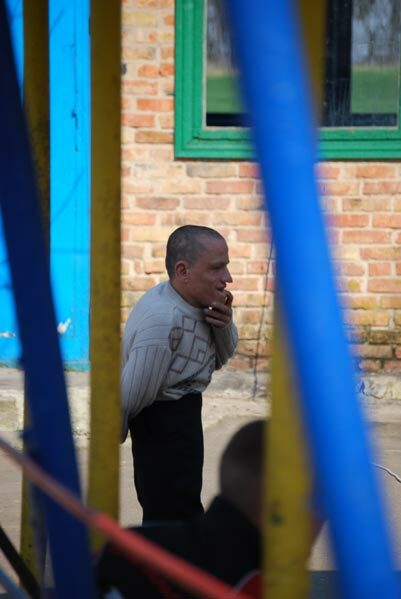 After my experience with these orphans in Kalinovka, I know I was wrong. These people with special needs understand a lot, and I sometimes get an impression they understand even more than we. I am writing not only about the children but to also share my own journey to the understanding which I lacked. This understanding takes time. Some of my acquaintances are not ready to look at the photos of those who live within the walls of the Child’s Home in Kalinovka. We often tend to close our eyes to many things as if they didn’t exist and never would. But these things are a part of our reality we need to learn to understand. There are also forty adult men who have forever remained children in their perception of life. Their mothers are often afraid of their own sons who are 24 hours a day looked after by ordinary village nurses. These women devote all their leisure time to their household and gardens while at their working time they take care of those whose parents did not feel ready to bear such a heavy cross. There is only one man out of forty who is regularly visited by his mom – who surmounts 15 km (9 miles) on foot just to spend two hours with her big son. The fact that her son is already grown up doesn’t change anything. He will always stay her beloved child, so she always brings him sweets. What do we usually do when we come across such a person on the street? Do we turn our eyes away, feel embarrassed or even indignant that “such” people are not kept in cages? 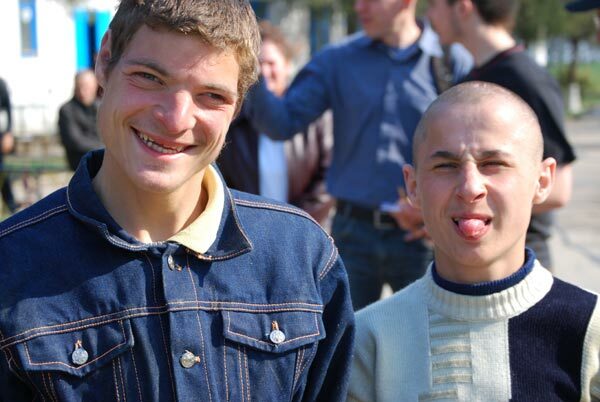 There are forty such people in Kalinovka. 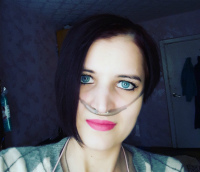 They are assisted with eating, drinking, washing, and dressing since many of them are absolutely not able to do such simple everyday things on their own. How would you act in the situation when a young guy always runs up you and tries to smell you over? This man, born deaf but with keen sense of smell, may confuse everyone but I soon got used to him and stopped paying attention to such trifles. One can just smile when some of these grown up children always call you “My Masha” or “My Tania”. It’s not a big deal that one has to greet and say good bye to them several times a day. But…but why are there so few visitors in Kalinovka and so many parents who repudiate their own children? Many of us are not emotionally ready to bring up children with cerebral palsy or children who have no limbs or suffer from any mental abnormalities. We’re simply afraid of taking such a grave responsibility. These children, however, are not worse or better. They are just different. Some children cannot speak but they can weave amazing bead crafts that we, two-armed, two-legged, and mentally developed people are often not able to do. Bead weaving is basically one of the main types of labour therapy for adults as well. These grown up dwellers also help to collect tree branches, carry manure, and set the table for themselves and for children from the crawlers department. Only ten of the men can perform such activities. The rest of the group does the same things all day long – sitting outside in summer time and sitting on the floor of the playroom in winter. These men have never been taught to do anything and it seems like it’s too late and senseless to do it now. Sooner or later these big children will have to move to a nursing home where they will be looked after by other nurses. And one day they will just peacefully pass away. 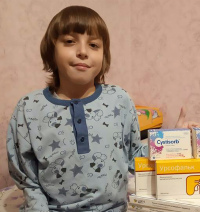 Some people I communicate with are honestly surprised by the fact that the Child’s Home in the village of Kalinovka it is not only the “Happy Home” social adaptation group. People are surprised that there are many departments for children and adults there. These children and adults really need our financial as well as moral support. There is also a department for crawlers, namely children who can somehow move around but still suffer from various physical and mental disorders. 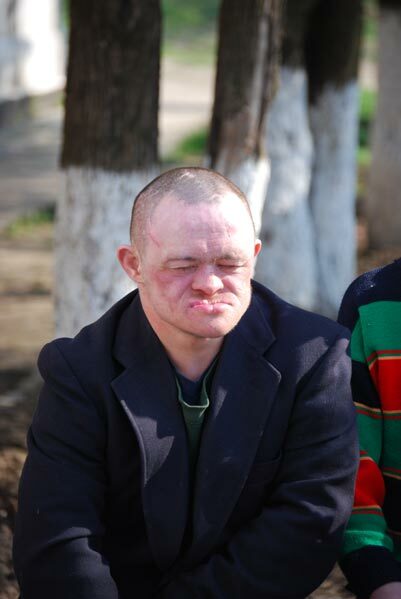 One of its dwellers, Dima, used to live with his parents until they could no longer stand his challenges and took him to the Child’s Home. This boy is able to learn and we truly hope he will have this opportunity in the new Happy Home adaptation group we will build soon. Here Zhenya also lives. 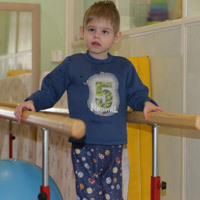 Zhenya, who always asks adults where his mom is and when she will come to him. Fortunately, his mom visits him quiet often. One cannot help noticing Alyosha who always draws zeros on a piece of paper. He’s said to have studied at school even though one can hardly imagine that children from Kalinovka will ever have any idea what school is. 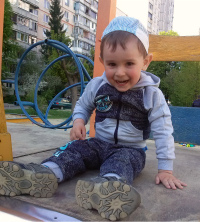 Vlad is a real sunbeam who always begs to take him to visit his friends in the new Happy Home and on whom we constantly had to keep our eye during our excursion trip in Berdyansk, so he would not break aquariums with fishes or disturb birds in cages. 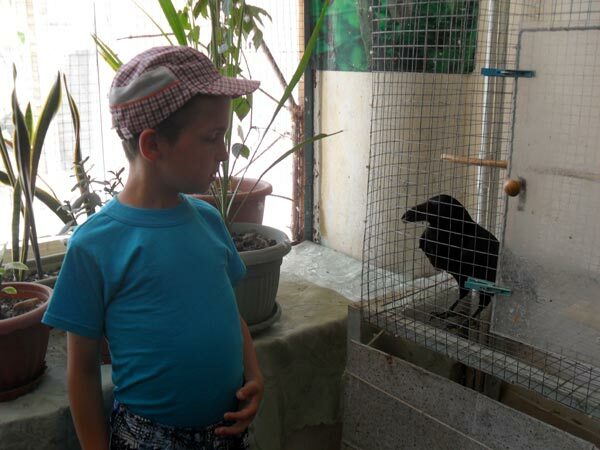 As soon as we turned our back he, like some other children, was pecked by a raven he tried to touch. It happens to everyone though. The children, who have recently moved to the family-type Happy Home building, visit their friends in the crawlers department. They don’t want to come back to their former building. They just visit Vlad and then return to their Happy Home - to this separate kingdom for children and employees in Kalinovka. Their new home is a fairy tale with a happy end. We can make this fairy tale real again and again if we manage to create more happy homes like this. Some of most promising girls are likely to become new dwellers of the next Happy Home. For example, twenty-year old Katia who still plays with dolls and doesn’t mind using an expletive or two when someone acts against her will. 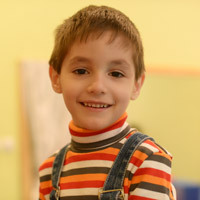 There is also Larisa who doesn’t speak well but is fond of drawing and is a fast learner of letters. She cannot hold her tears back when we return to the orphanage from our little sea trips. She understands it very well that such joy won’t repeat soon. Since I have started to visit the orphanage in Kalinovka, I don’t get shocked about many things there anymore. What makes my heart bleed are the smell of those departments and incredibly unspoken amount of torments and pains these little orphans have to face silently. They even don’t know what “does not hurt” means. These little angels are bravely enduring their sufferings while our society pretends that these children do not exist among us at all. 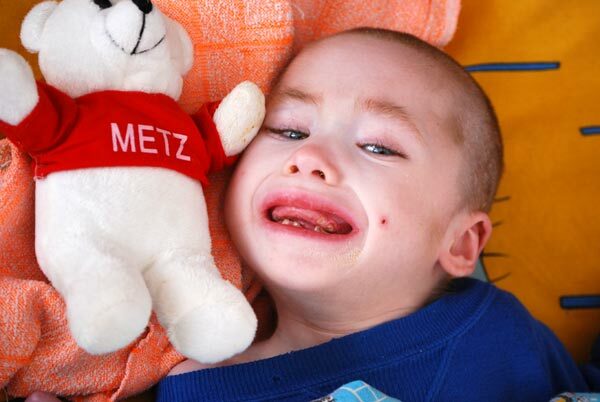 It is very comfortable to hide these handicapped children 93 miles away from the city and in this way avoid any sorrows of our mind and soul. These often twenty year old children look like ten year olds but think and behave as if they were three. 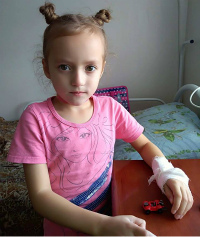 Many ten year old orphans in Kalinovka weight like three year-olds due to the lack of effective physical therapies and nutritious protein meals the orphanage just cannot afford to buy. The greatest shock visitors in Kalinovka experience is the department for the youngest children. There one can see children who are endlessly suffering from severe pains. These blind and skinny children always cry, scratch, and bite themselves. One can get an impression these little martyrs are paying for our sins. Looking at never ending pain of these children immediately raises the question, “Does it at all make any sense”? Would it be perhaps easier to deprive them of their life at the very beginning, at the maternity ward as soon as it is clear that these children would have nothing else in their future but sufferings and long years of fighting for their existence and health? No, this is not easier. The rain storm won’t stop just because we pray to the Heavens to do it. Reality won’t change if we just refuse to call it as it is. Someone’s pain won’t be relieved if we just close our eyes to it. Someone’s pain will in some way imprint itself in our souls. We never know what future awaits us ahead. We also have no idea what the future holds for our children. 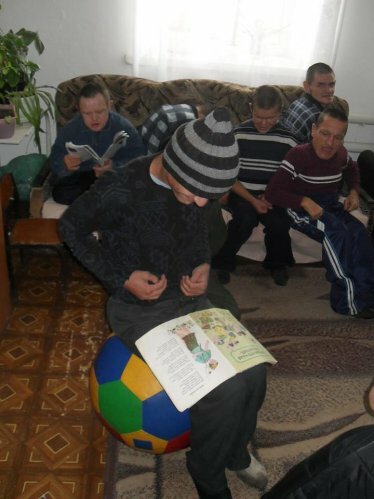 Children in the Child’s Home in Kalinovka are also humans. They are very suffering people who first of all need our attention and recognition. They need to win the recognition of their right for life and for living it with joy. Take my hand whether you are near or far, take my hand and steady me in this journey. Together we can make a difference. Don’t be afraid of helping these children and anyone else. Don’t turn back from someone’s problems. And keep in mind that everyone can, if even for a minute, make this world kinder and brighter! 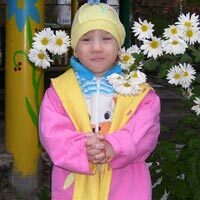 If you decide to help children in the Child’s Home in Kalinovka you can contact the employees of the “Happy Child” charity foundation and together we’ll be able to bring these children a bit more joy!